Babbel is an online language learning platform. It provides everything you need to speak, write, and understand a new language. Users can learn 13 languages whenever and wherever they want —on their computer, tablet or smartphone. Founded in 2008, Babbel now has over 20,000,000 users from more than 190 countries. Babbel aims to raise awareness of its learning platform and how easy and affordable it is for people to learn a new language. Babbel uses its online magazine as a content marketing channel , to reach potential new learners and ultimately achieve more registrations and app downloads. The scalability of distribution through content discovery is instrumental to the continued growth of content marketing as a channel within Babbel’s performance marketing portfolio. 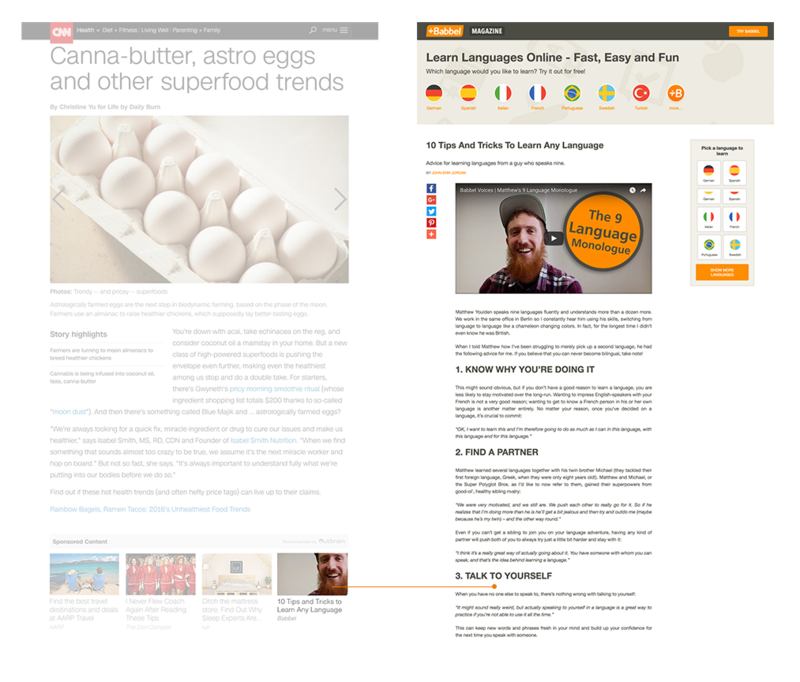 Babbel amplifies its content across Outbrain’s publisher network, targeting relevant audiences across several countries, languages, and devices. Outbrain is able to geo-target relevant readers depending on their location and language. For example, those reading English language sites in Germany may be targeted with content on learning German, or people located in California may be shown content relating to learning Spanish. Babbel began by trialling Outbrain with just one article – “10 tips and tricks to learn a language.” After seeing positive results, Babbel expanded the campaign and it now uses Outbrain to promote a broad range of content across different countries, languages, and platforms. The number of registrations coming from the amplification of the magazine’s content increased by a three-digit percentage in the first month in which Babbel worked with Outbrain. Outbrain became one of Babbel’s biggest traffic providers, driving 4.5 million users each month to the magazine, 80% of which are new. We were able to see clear and direct results through increased traffic registrations and subscriptions. We quickly took advantage of Outbrain’s global reach, expanding the content we amplify to include five other languages aside from English, enabling us to promote our magazine all around the world.